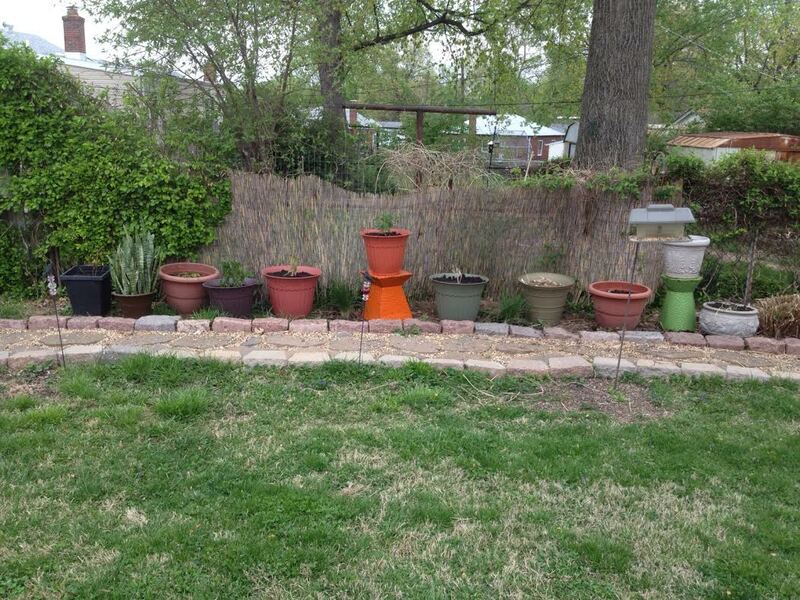 Here’s the pottery garden we worked on last Saturday. It runs along the fence that divides our yard from the neighbors, and as you can see, we have a pebbled path right in front which leads from our back door to the patio. This is a narrow space that we discovered is full of chat rock because there was once a driveway here that led to an open garage (now our patio). So, the soil is shallow and full of rock. It’s also become a run path for the dogs. Our neighbors have dogs, so our dogs run up and down the fence and bark at the neighbors when they are out. So, it’s impossible to plant anything here, much less get it to grow. No more running and barking now! Gathering the pots here was a perfect way to block them from doing it, and a good use of space. We had most of the pots already scattered on the patio. 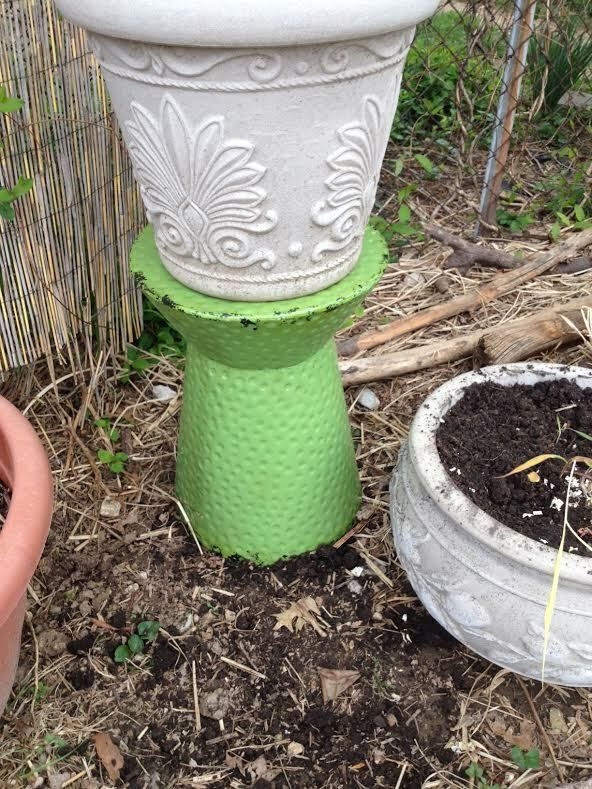 We added four new ones though, and two new metal plant stands that we found at Tuesday Morning (pictured below). Three of the new pots have new ornamental grasses planted in them that I bought online last year and which just got delivered a few weeks ago. If they grow and do well, we’ll eventually transplant them into the ground. One of the pots has Asiatic lilies in it which I dug up from the ground on Saturday. It seems rabbits love lilies, so no more planting those in the ground. I only have them in pots now. 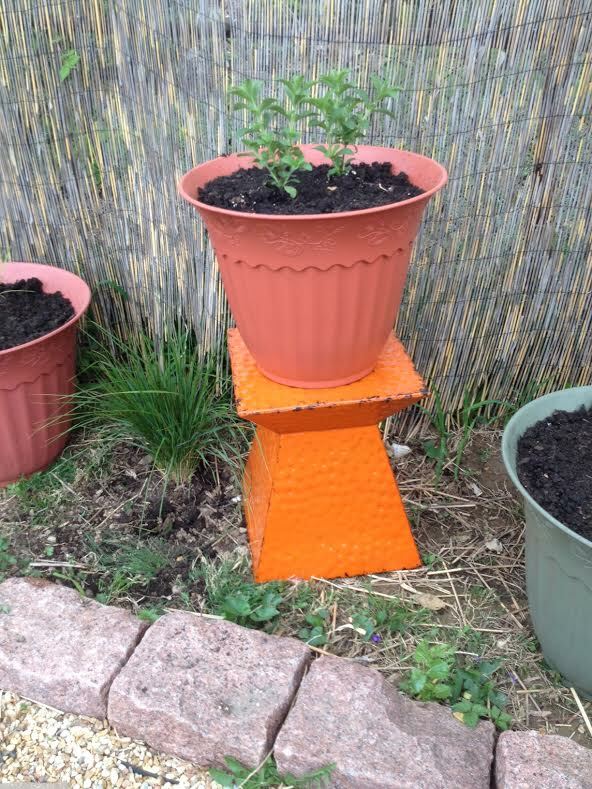 And the pot on top of the orange plant stand has Stevia in it, another rabbit favorite that had to be planted out of reach.